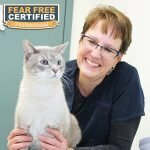 Katrina has been with the Weare Animal Hospital for many years. She is our “Jack of All Trades”, she’ll fix it, paint it, or groom it. She has enjoyed having the opportunity to share in the lives of so many of our patients. She has had a menagerie of pets over the years including dogs, cats, horses, goats, turkeys, pigs, and various other farm animals. She currently has two Morgans, Ace and KD, Molly her Quarter horse and two crazy Nigerian goats in the barn. She also shares her home with cats Ranger and Ivy, both Siamese crosses, and dog Eva, a Smooth Fox Terrier. She has attained obedience titles competing in AKC shows in the past and spent many years going to 4-H and AKC dog shows while her daughter competed in Jr. Showmanship and breed classes. She enjoys volunteering with the Rolling Bones dog 4-H club. Katrina and her husband have raised their two children here in Weare and are now spoiling their grandchildren. When not at work she enjoys horseback riding, motorcycling, hunting, and reading.